For more MBX movements and mindfulness practice guides, visit MBX-12, MBX Warm-up, Meditation Tips. Cradling posture stretches the lateral sides of body. Leftward twist (Photo 2 below) stretches the right side of the body while compressing the other side. The head turns first, then the neck and torso and legs follow. Your feet are planted firmly on the ground, but your knees and hips should be supple enough to accommodate the twist safely. 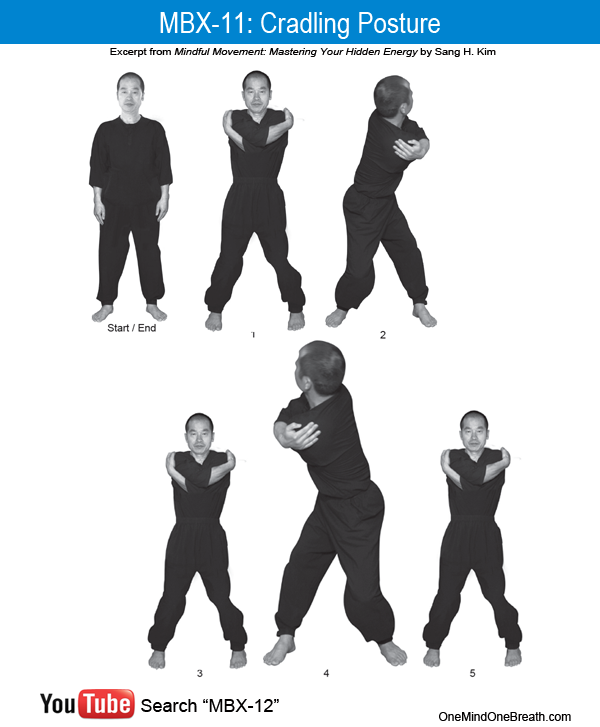 From natural stance, place your arms around your body with your hands on the opposite tips of the shoulders. Inhale. Exhaling, slowly turn your head to the left, and then turn your torso. Push your right leg toward your left leg for an additional twist. Hold that position for 3-5 seconds. Inhaling, turn your body to the front. Exhaling, slowly turn your head to the right, and then your torso. Push your left leg toward your right leg for an additional twist. Hold that position for 3-5 seconds. Inhaling, turn your body to the front. Exhaling, return to natural stance. Cradling is a soothing exercise. Slow and progressive mindful turning of the body awakens the vital points along the Gallbladder Meridian. Be aware of the internal changes that occur as you twist. Maintain a steady shoulder height during turning, and exhale slowly. When you turn your head, scan your eyes along the same horizon to actively engage your attention with visible objects. Synchronize your breath and movement. Be one with movement and breath by fulfilling the natural need for out-breath during stretching and in-breath during return to the start position. Cradling your torso with your arms creates a sense of unity of the upper body. 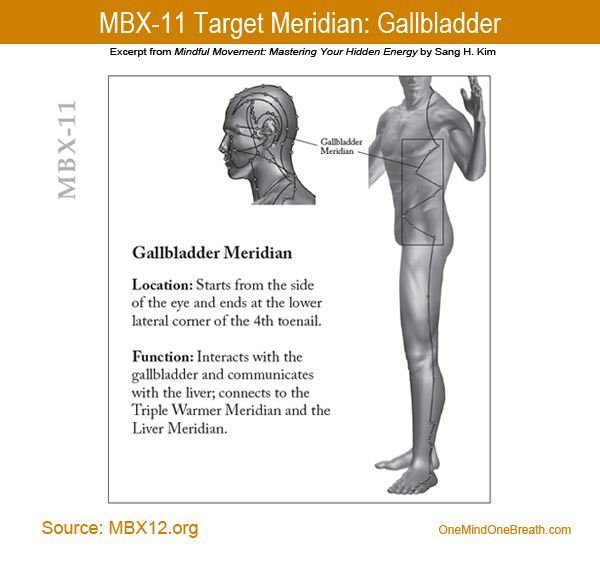 The lower body provides the leverage and stability for the twist to generate maximum stimulation of the Gallbladder Meridian. 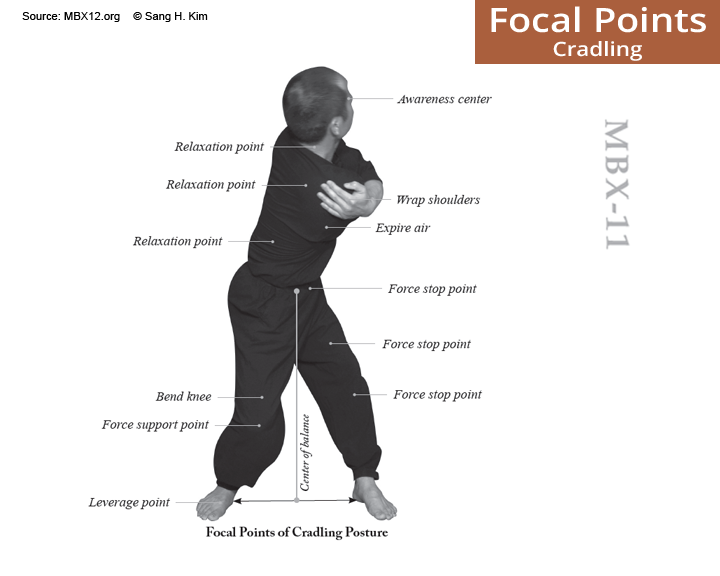 Cradling Posture activates the Gallbladder Meridian which starts from the side of the eye, circles around the skull, descends on the lateral sides of the torso and legs, and ends at the fourth toenail. Did you feel stretching and flexing on the sides of your body? Did you experience a soothing effect during or after this exercise? Did you control your movement at all times? This entry was posted in MBX-12 Workshop, MBX12, Mindful Movement and tagged Breathing Methods, Calming Effect, Chi, Circulation, Comfort, Cradling Posture, Equilibrium, Gallbladder Meridian, MBX-11, Sang H. Kim, Self-assessment, Soothing. Bookmark the permalink.